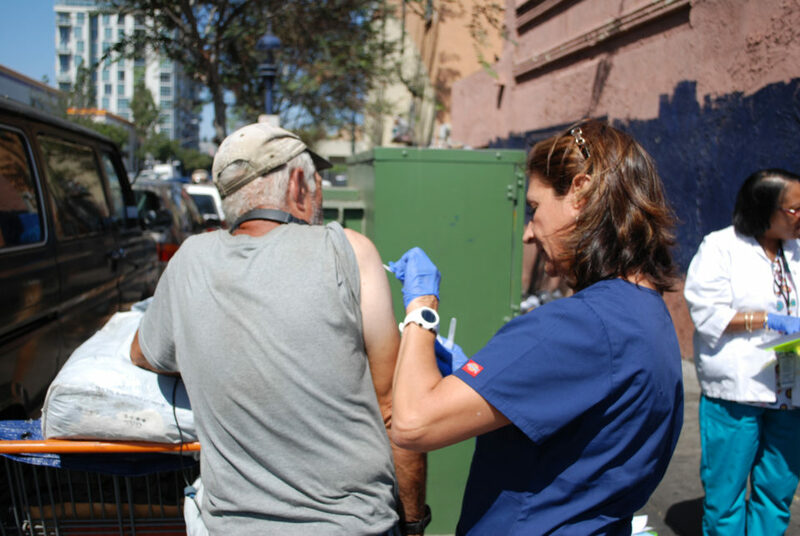 HHSA nurse and law enforcement teams went out in the streets to find and vaccinate consenting homeless and illicit drug users, two populations most at-risk for the Hepatitis A outbreak. Congratulations to employees involved with six programs selected for California State Association of Counties (CSAC) awards. The County won two Challenge Awards and four Merit awards, for finding innovative, effective and cost-saving ways to provide services to residents. One Challenge Award recognized the County for its vaccination outreach in response to the Hepatitis A outbreak in 2017. HHSA developed new strategies and tools to reach homeless and illicit drug users to help contain the outbreak. Among these new strategies were nurse and law enforcement foot teams, extra vaccination events, and collaborating with local organizations such as hospital emergency departments, jails and drug treatment and homeless service providers to offer vaccinations in these new settings. A second Challenge Award recognized the County for a portable charging station program that provides power to medical assistance devices during extended electrical outages anywhere in the region. The Office of Emergency Services initiated the program and has pre-staged 14 portable generators at County maintenance facilities around the region to be deployed as needed for vulnerable community members. Another 11 supply trailers to support the generator deployment are positioned at five designated Red Cross shelter sites, four HHSA facilities and the County Operations Center. 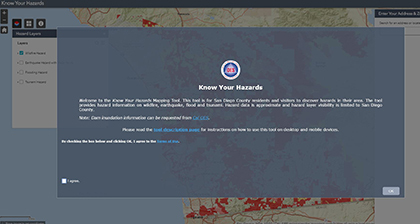 The Know Your Hazards web page allows residents to look up hazards at their home, school, workplace or other area in the community. The County developed the Defense Transition Unit to help criminally accused clients get timely mental health assessments and link them with mental health treatment during the early stages of the court process. The innovative solution enhances mental health care while reducing time in county jail. The goal is to improve quality of life for clients and the community over time as treatment reduces revolving-door recidivism. Emergency Services launched a Know Your Hazards online tool, which helps residents prepare for hazards at their home, school or work in the community. The interactive mapping tool provides hazard and preparedness information on wildfires, earthquakes, flooding and tsunamis in both English and Spanish. Users need only provide a street address or drop a pin on a map to search. Child Welfare Services implemented the Justice Electronic Library System (JELS) to distribute court documents to stakeholders by simultaneously uploading to various secure SharePoint sites for each stakeholder. This process eliminates waste, reduces travel time and improves delivery times. Reports are time-stamped and the system interfaces with the Superior Court Juvenile Dependency Data System. Health and Human Services developed a new telephonic signature process for CalFresh semi-annual reports. Customers leave an audio file as a signature. This process delivers enhanced service by avoiding delays if forms had to be mailed, delivered in person to a Family Resource Center or through a website. This solution has assisted vulnerable customers such as the homeless, customers with transportation or mobility barriers, and customers that cannot take time off work to come into an office.